Neil Hokanson holds a bachelors degree in Education from the University of South Dakota (1993) and a masters degree in Education with a focus on Instructional Technology from the University of Wyoming (2006). Neil will begin his 24th year of working in public schools and taught in the public school system for 13 years at the middle and high school levels as a social studies teacher in South Dakota and Wyoming. He extensively integrated technology in his classrooms for several years and served as an instructor for many staff development courses and presentations in the districts he taught in. As a school technology specialist Neil has provided training, support, and assistance in helping educators integrate technology in all subject areas and grade levels. 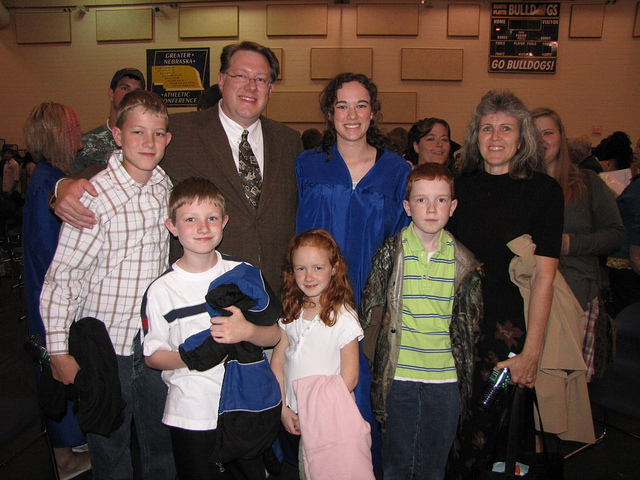 Neil served as the educational technology director for the North Platte Public Schools in Nebraska from 2007-2012. He moved back to the classroom in the Fall of 2012 and embedded Android tablets, a BYOD networking solution, and created an extensive tutorial library at Hokanson’s American History in his Adams Middle School classroom. In 2016, he moved back to his native state of Wyoming and the capital city of Cheyenne to begin teaching 7th grade World Geography at Johnson Junior High School. His new classroom site, Hokanson’s World Geography, is growing and improving each day. He is the proud husband of Dianna, a veteran speech-language pathologist, and father of 5 beautiful children: Hannah, Charlie, Ronan, Nicholas, and Heather. you are the greatest teacher i have ever had and i miss you so much but im so glad that your happy but you probably thought i was a bad student because it talked a llot in class every time i was in there and i just wanted to tell you that i will miss you so much i hope people can see this comment because i want to tell people that you are a great friend and teacher i could talk to so i hope you have luck were you are going to and i will tell people your website so have fun and good luck with your new job your going to i hope you find love and friends where your going so i just wanted to say good luck and i will miss you so much and maybe you will come and see us in the time you are here and tell us where your going. your old student Megan Reinhardt 7th grade and i hope you can show people what i wrote to show them how good of a guy you really are!!!!! Just so everyone knows, Megan is a wonderful student, and I never thought she talked too much! 🙂 Thanks for the kind words Megan, and I will try and stop in to see you all before I go. Keep studying and working hard so that you can achieve your goals. You have so much potential!!! To have a biography written in 3rd person is evidence of reaching a higher level. You are now on a higher level. I don’t know if you remember me. I an an OT in the LCSD2 district and I coached your daughter in soccer and worked with your wife. I was just wondering if Hannah is still playing soccer and how Dianna is doing? I hope everything is going well. Your website is great. We have just released new versions of both programs which reflect hard work by our Google Summer of Code students. Both programs have been very substantially improved. Hello, please may i use one of your images from your website, for my ICT GCSE project, only me and the examiner will see this image. My name is Robert Bailly from CourseCracker.com and I was just on your personal website and noticed you have a “Bits and Pieces” page here: https://nhokanson.wordpress.com/my-other-sites/ containing some great educational resources. The sites mentioned are great, and inclusions are of course at your discretion, though we were respectfully wondering if you were familiar with our collaborative learning platform, CourseCracker.com as well, with regards to sharing information and improving communication between educators and students. Improving communication is very important for every teacher and student, and CourseCracker.com is an online community for academic networking, discussion and media sharing. The site is completely free and offers a unique platform for enhancing learning among students. “Course Tracker” allows teachers to manage their classes and keep in touch with students–with a private page that features a bulletin board with email notifications, discussion board, document storage, video/photo galleries & more (http://coursecracker.com/teachers-professors/educator-resources/index.html) In addition, Course Cracker also features Educator Forums, Educator Groups, and a Teachers Lounge. If you have time, it’d be great if you could check out our site and add it to your list of resources if you deem it a beneficial resource for your visitors.